Remote control vehicles are one of the most entertaining ways to spend some time outdoors during the warmer months of the year. There’s a wide range of RC models that people can pick from, depending on the type of driving they want to do. These models include RC cars, crawlers, buggies, truggies, monster trucks, short course trucks and more. Typically, RC vehicles are modeled after full-size cars and trucks and are just scaled down in size. You’ll find 1:5, 1:6, 1:8, 1:10, 1:12 and smaller sized models, but before you decide on a model and size, you should get a grasp on what the difference between the different types is, and what kind of riding each model is best suited for. For starters, RC cars are the go-to option for racing on even surfaces. They’re incredibly fast and generally feature a brushless electric or nitro motor for maximum performance. However, they don’t have as much ground clearance as buggies, truggies, trucks, and crawlers, which makes them unfit for off-road driving and conquering obstacles. Most RC cars are scaled 1:8. Next are the RC crawlers, which have become extremely popular as of late. Their main purpose is, as their name implies, crawling on obstacles or rocks. Similarly, rock crawlers can feature a nitro or an electric motor. Unlike RC cars, crawlers feature great ground clearance and large wheels that help them get over tough obstacles. 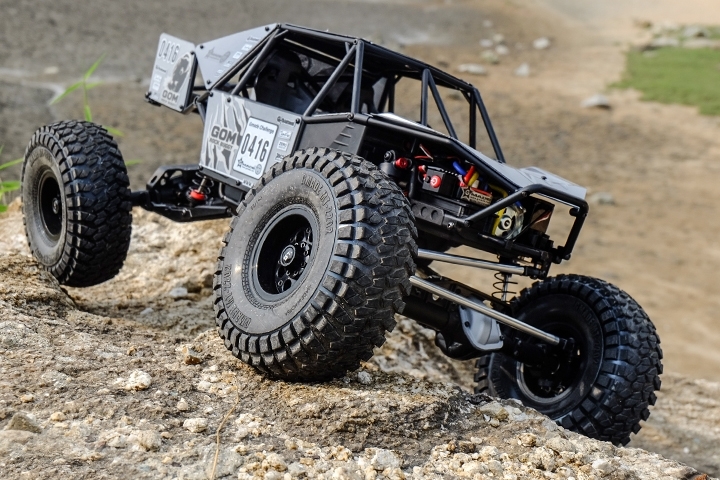 As far as scaling goes, the most popular size is the 1 5 scale rock crawler. The 1 5 scale rock crawler is bigger than the average 1:8 RC car, which means its also more expensive, but you can ride it in rough conditions. RC trucks are another popular option, as they’re well-versed in all different types of driving styles. You can drive them on and off the road. Like the previous two, RC trucks can feature an electric brushed or brushless motor, or a nitro motor, if you prefer driving faster. Trucks feature high clearance, larger tyres than RC cars but smaller than crawlers, and they come in a wide range of scale models, with the most popular ones being 1:5, 1:8 and 1:10. Buggies are similar to RC cars, except they’re made for off-road or dirt racing. They’re wider than other types of RC vehicles, and they feature small wheels and brushless or nitro motors. RC buggies have low ground clearance, and they come in standard RC car sizes, with the most popular one being 1:8. Truggies are a mix of RC trucks and buggies, and they basically combine the low ground clearance of buggies and the large wheels of trucks. A truggy is what you get if you’re not set on a single type of RC driving and want to explore all of your options.